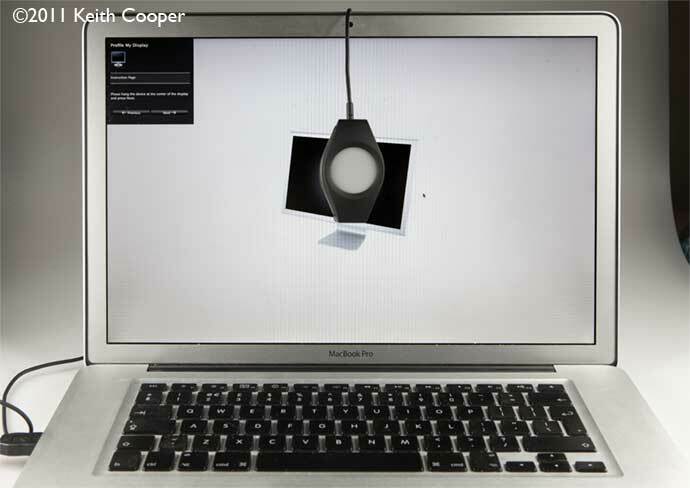 Keith Cooper has been testing X-rite’s latest display and projector calibrator. 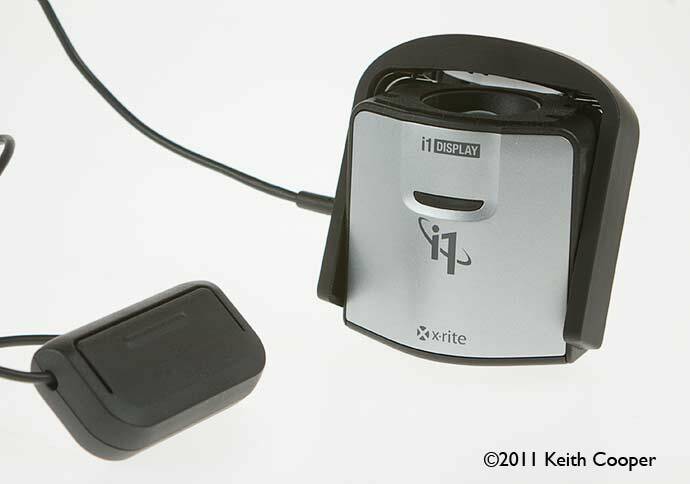 The i1 Display Pro is an all new design of colorimeter. 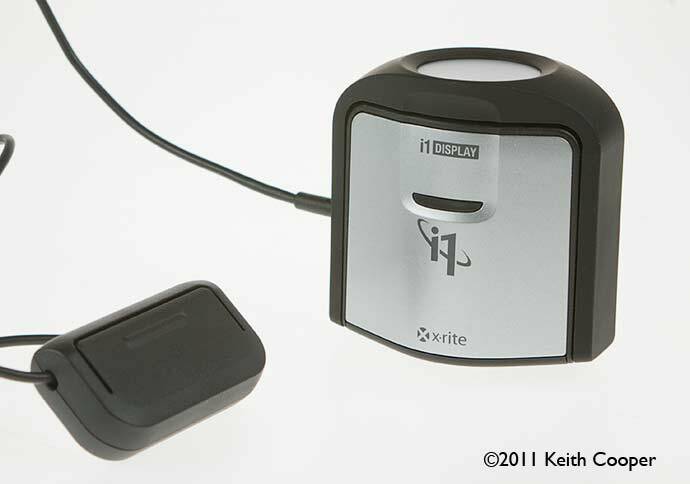 The i1Display 2 has been a reliable and popular calibration device for several years. However, when we first looked at it, many people were still using CRT based displays and LCD displays only had fluorescent back-lighting inside them. 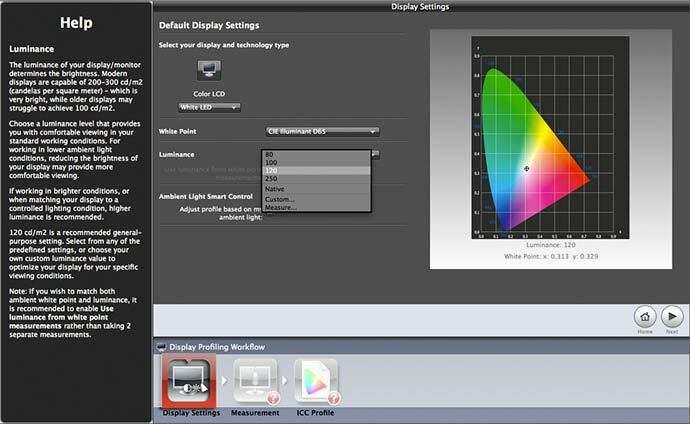 Display technology has moved on, with wider ranges of colours (gamut) and new LED based back-lighting. 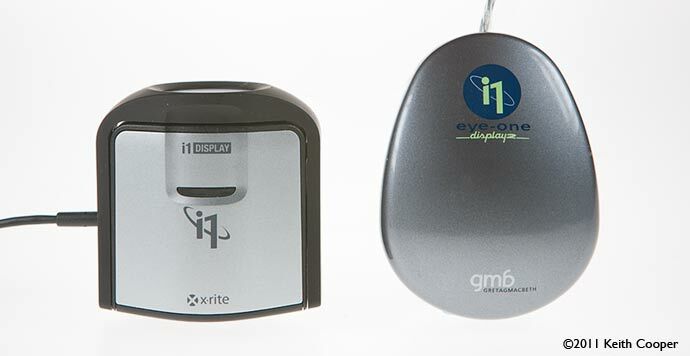 The new Colorimeter from X-Rite is available in two versions. There is a more basic version called the ColorMunki Display (full review), which is aimed at a wider market. This review looks in detail at the ‘Pro’ version. It compares specifications between the devices later in the review and offers some thoughts as to what might best suit different users. The examples shown are using Apple Macs, but the software generally works in the same way on Windows machines. Only the other day I was visiting a company to give them some photography training and I discovered that not one monitor in their design department was calibrated. Colour variation between screens was accepted as ‘just one of those things’. It was thought to be part of the difficulties of getting accurate colour. Fortunately I had a monitor calibrator with me and was able to show the difference it made to my laptop. Colour management isn’t about perfect colour (whatever that is). In a business context it’s about getting things right first time more often. I believe quite a few calibrators are now on order (we don’t sell equipment or software by the way). It won’t magically make your prints match your screen, but it should help improve things. If you can’t say that the colours on your screen are accurate, then how can you be sure what to expect when someone else looks at your images or prints them. However, just in case you are still wondering just what this ‘Colour management’ stuff is, I’ve a very short guide to colour management page that might be of help. There are also links to further information at the end of this article. supports all modern LCD display technologies including; CCFL, White LED, RGB LED, and Wide Gamut display technologies as well as projectors. Software has also moved on from the old i1Match software used previously for monitor calibration and profiling. The design of the new i1 Display device is a quite different one from the normal ‘puck’ style, such as the i1 Display 2 below. In the photo below, you can see the diffuser at the top, which is used for measuring ambient light. The black object to the left is the counterweight. This attaches to the USB cable and hangs behind your monitor when measuring it. The lead should be long enough for most display setups and the device worked fine plugged into one of the USB ports on our Apple monitor. The sensor has a huge lens in front of it – be careful handling the device, since fingerprints won’t benefit the long term accuracy of the device. 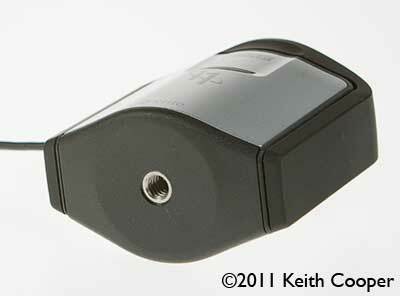 The 1/4-20 standard tripod thread is on the bottom of the unit. If you’re setting up a projector, then you will need a tripod head that tilts 90 degrees. 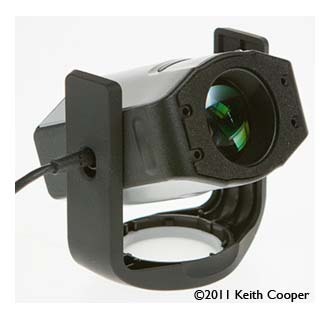 The measurements for projectors are carried out with the diffuser out of the way of the sensor. The software runs on Macs and PCs, but it’s worth noting that it won’t run on older PPC based Macs. I tried the i1 Display Pro on a MacBook Pro laptop and my own dual display Mac Pro desktop machine. 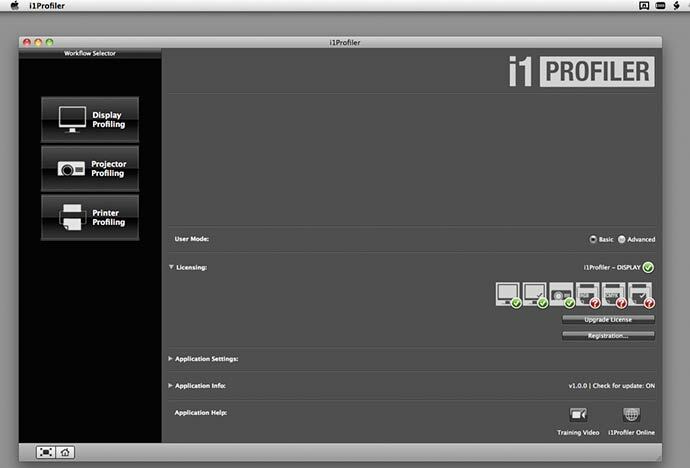 If you already know the new i1 Profiler software, then there is nothing new here. You are effectively using a different measuring device to run the same software that you would be using with an i1 Pro spectrophotometer. So for all those people who wondered why you couldn’t use an i1 Display 2 with i1 Profiler, then answer was (as widely guessed) that a new measuring device was on its way. If you’ve an i1 Display Pro device plugged in, then i1 Profiler shows that the monitor/projector profiling parts of the software are enabled. I’ll cover some of the basic aspects of display profiling here, but if you’re interested in the more advanced options, I’d suggest also having a look at the particular review of monitor profiling in i1 Profiler that I wrote a short while ago. The majority of users should be comfortable with the basic/default setting for their monitors. The only aspect I’d normally alter, is to use a reduced luminance of 100 cd/m2 for my desktop screens. This lower luminance can help me get better shadow detail in my prints, since having your monitor too bright is the most common cause of prints coming out too dark. Note the text to the side of the settings – this is context based help and offers some assistance in choosing your settings. One example, from a more specialised setup, might be measuring the light from your print viewing cabinet, to match colours more accurately. This is however beyond the sorts of use I really require for any of our work here at Northlight. Over the years I’ve seen a lot of so called ‘reviews’ of equipment, barely much more than a re-hashed press ‘information’ pack. You can see that there is a setting for the grandly named ‘Ambient Light Smart Control’. 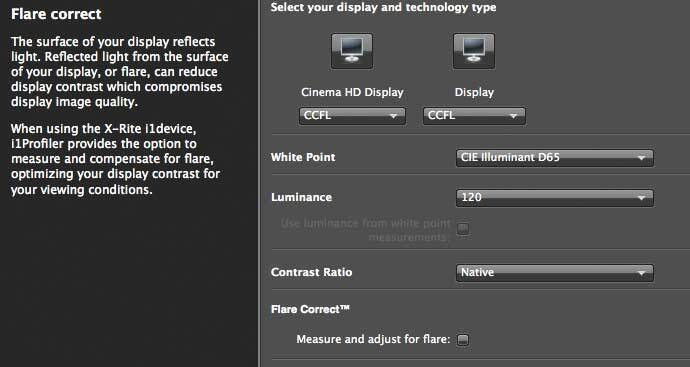 This will adjust your monitor profile based on ambient light characteristics. I’m told by X-Rite that this is most definitely not the Pantone huey ‘randomly adjust my monitor when the sun goes behind a cloud’ feature that I regularly tell people to deactivate. That said, the idea of my monitor setup changing of its own accord is not one I’m comfortable with, and was pleased to see that it defaults to ‘off’. The device will measure a number of colours on your screen, and can set screen brightness automatically if the feature (ADC) is available. The device reports back the position of the ambient sensor cover, and reminds you to move it if need be. Here’s the device attached to my laptop, ready for measurement. In general, I’d always suggest carrying out calibration in dimmed lighting, so as to minimise any interference with the measurements (particularly since the detector covers quite a lot of the device’s screen ‘footprint’. The whole screen flashes different colours during the measurement process, which takes a few minutes. After the readings are taken, you can see target/measured colours. I usually set a meaningful profile name, but then again I test a lot of different kit – for most people, just take the suggested name. I always put profiles at the system level, since one profile covers all my uses of the computer. However, you might have multiple users who prefer different setups for different tasks, where the user level profiles are more appropriate. If you do take this approach, then be very careful that you know just who is logged in to the machine if you are looking at an image on the screen. Display curves and a 3D gamut display are also available for your perusal and amusement. I tested projector profiling using a Sony VPL-CX21 XGA projector connected to my laptop – once again the software is very similar under windows. 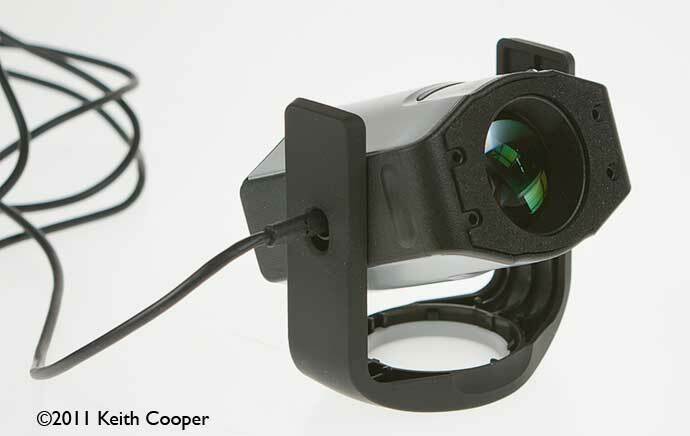 The base of the device has a 1/4″ standard tripod mounting underneath, so you will need to tilt your tripod head to point the sensor at the screen. The ambient diffuser can be used as a stand, if you’ve somewhere it can rest during the process. You can just follow the on screen instructions for projector calibration. You may want to alter the controls ‘by eye’ on the projector before the process, since I’ve found that getting the projector looking reasonably OK before calibration can make for better final results. The software offers numerous more advanced profiling and measurement options. I’d suggest that unless you know you need them and more importantly -why- you need them, then such items are for the curious wishing to experiment. The majority of potential users (myself included) are well served by the good range of standard options. I’ve covered some of these options in the i1 Profiler software review, which is based on using an i1 Pro spectrophotometer, rather than the i1 Display Pro colorimeter reviewed here. You can import and add colours to the target set that is used in the profiling process or profile QA (quality assurance) and profile optimisation. The spot colours will need to be in a CxF3 (Color Exchange Format 3) library. 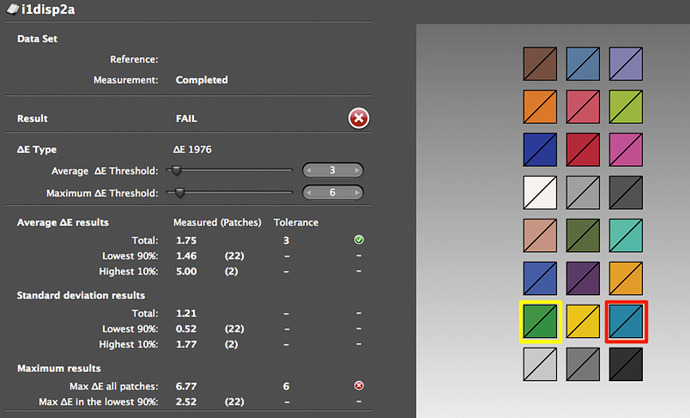 You can add Pantone spot colours via the Pantone Color Manager software. The display QA functionality is, I’m sure, of use if you are looking after a large number of colour critical displays and want to spot variation and change, or which are ‘best’. After running the display QA test for my MacBook Pro, it failed! 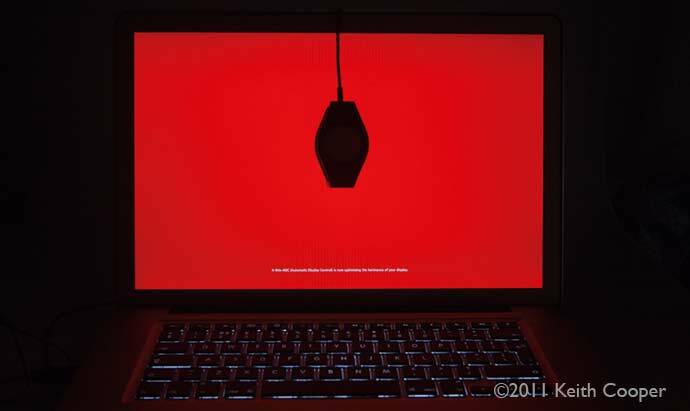 My own laptop display is shown to be less than optimal – does this worry me? 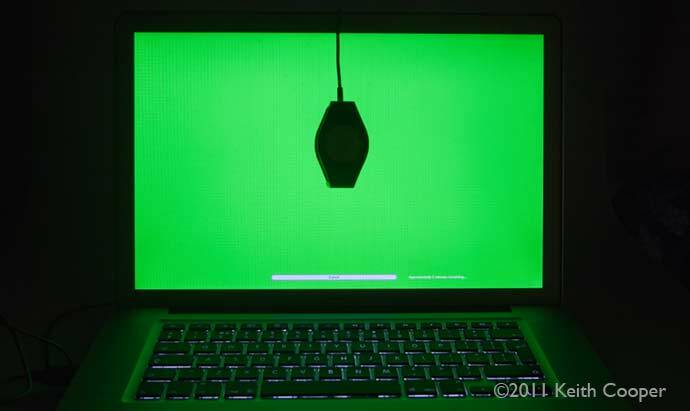 Not really, I’m hardly likely to be using a laptop screen for colour critical editing. As you can see, some colours are not close enough to meet the dE 1976 requirements. The Display Uniformity feature allows you to measure your monitor’s ability to display colour consistently across the whole screen. Data is collected by measuring the centre and then at eight additional points around the perimeter of the screen. Results are reported in luminance difference (dL*) as well as color difference (dE). One of the advanced features of the i1 Display Pro solution is a means of addressing the effect of ambient lighting on your screen. However I’m minded to think that if reflected light from your screen is that much of a problem, then you should address your working environment first, not tweak your monitor settings to try and cope. 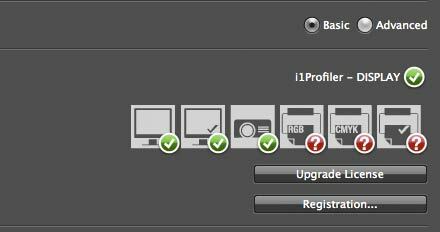 Using i1 Profiler with the i1 Display Pro allows you to create monitor profiles that allow for such effects. You do this by taking additional measurements with the sensor not in contact with the screen. This light measured is a combination of screen output and reflections. It’s worth noting that X-rite’s notes suggest that using this mode may lead to ‘reduced colorimetric accuracy’. The ColorMunki software is designed to be simpler to use, but is essentially doing the same thing, if you stick to the simpler options. As a monitor calibrator, it works quickly and effectively, and profiles compare favourably with devices many times as expensive. If I was looking for a comprehensive profiling solution for print and display, I’d certainly consider i1 Profiler with an i1 iSis for measuring and creating my printer profiles and an i1 Display Pro for my monitors. I’ve not included any detailed numbers here, but the profile for my laptop (after a few more adjustments) seemed smoother in the shadows than that made with an i1 Pro spectrophotometer (the i1Display Pro being a colorimeter). Indeed, for basic calibration it’s worth looking at the ColorMunki Display (full review). This is also a colorimeter which handles multiple monitors and projector profiling. It’s noticeably slower to run, but for individual users this might not be so important. The device does lack a bit of the solid feel of the old i1Display2 – I like to keep precision instruments in a drawer out of the way of dust and cups of tea – so having it sit on my desk all the while (for ambient light monitoring) is not a way I’d personally want to use it, even with the diffuser in place. The ambient monitoring and ‘flare’ options certainly do work but are not, I suspect, included for more critical users. I should note that X-Rite’s web site does have more information available, but I feel it would be more use if some of it was included with the application. The software installs quite a few background processes, that look for the device being plugged in, or handle ongoing ambient light measurement (if you wanted it for some reason). I found these mildly irksome and removed the startup items on my Mac – of course this means that I have to fire up an extra bit of software (i1 Profiler tray) when I want to use the calibrator, but I regard that as a minor issue compared to one less coloured icon along the top of my screen that I can’t disable. Remember that I do quite a lot of testing and experimental work on my machines, so having assorted processes running for an application I might only run every other week is just one more potential conflict. 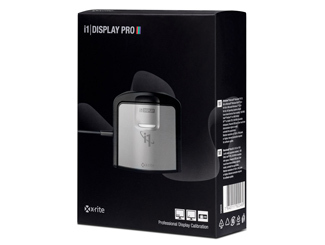 At the moment, the i1Display Pro hardware is only supported by the i1Profiler software – I’d expect this to change over time, much as it did with the i1Display 2, where the device was widely sold in the OEM market with monitors. 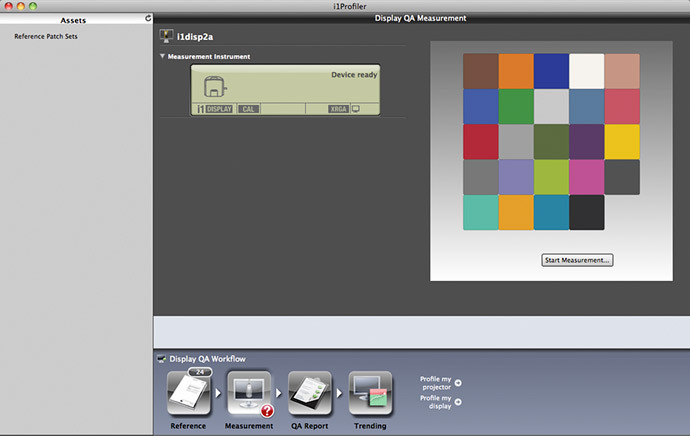 The i1 Display Pro comes with the Pantone Color Manager software. Monitor calibrator with support for multiple monitor systems and projectors. 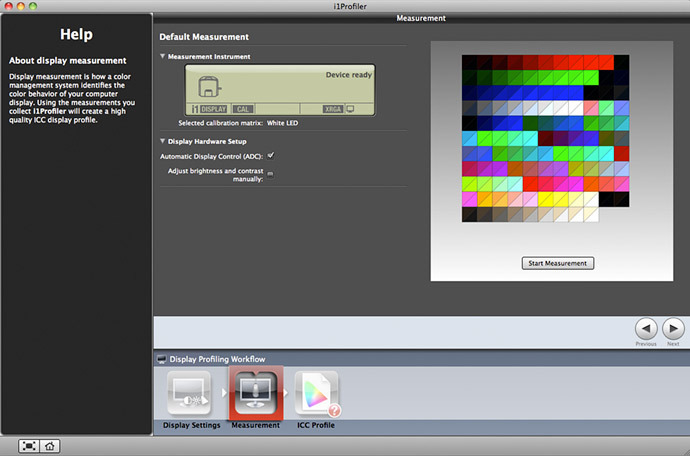 Uses i1 Profiler software for calibration and profile creation. Before calibrating your monitor on older Windows PC systems, you should check to see that Adobe gamma is turned off if it was installed. We’ve got a short guide to removing Adobe Gamma that might be of help.